Social media is becoming more and more influential in today’s world and, whether you like it or not, no sector of the economy is spared. What is the impact of social media on restaurants? How do some people use the power of social networking to their benefit? And what do you do if you find yourself in an embarrassing situation like having a blogger who refuses to pay the restaurant bill? 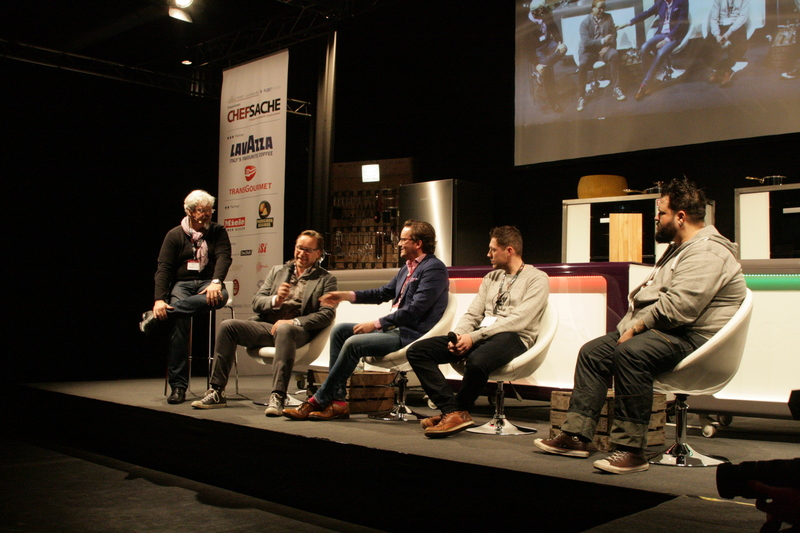 This topic was the subject of a very interesting panel discussion at Chef Sache in Cologne animated by Ralf Bos. It is not an easy subject and the same issues also apply beyond the food and wine world. In many cases there is no right or wrong answer. The panelists were German chef Thomas Buhner, Giovanni Zanetti, the Wine Punk, Dr Ingo Scheuermann, a professor of finance who is crazy about food and fine-dining and writes about food on www.culinary-insights.de and Sebastian Wussler who created the Chefstalk Project. Giovanni Zanetti has a winery in Italy and sells pretty much all his wine by marketing via Facebook. “I first thought that it was stupid to do this but then discovered that this was actually ideal. I started in this way because of lack of money. I could not work on a proper marketing campaign. But the community grew. Not all of the community engage but it is always helpful to be able to reach a large community,” Zanetti said. Sebastian Wussler said that when they were working on a project in Berlin to organise a German culinary week, they sold tickets via social media. “We had a tremendous response. We organised an event in Singapore and guests even came from Chicago for the event. This thing can only spread via the web,” he said. There was a debate about whether a blogger or food critic should pay or not in a restaurant. It is a thorny issue that is rather sensitive because of objectivity, ethics and conflict of interest that might emerge. There was no right or wrong answer other than agreement that this could be embarrassing both for the blogger and for the restaurant. Chef Thomas Buhner said that he took time to get on social media but recognised its importance nowadays. Obviously if you are being followed, you tend to be a good performer and performance is important. There are obviously cultural differences in different countries which result in different approaches to social media. There are countries which are more open than others. It was evident from the discussion that the German culinary world was still more cautious than other countries in its approach to social networking. But there seemed to be a recognition that restaurants also need customers and social networking was a good way to engage with people and sell an experience.